I can honestly say that having Hurricane Sandy downgraded to Hurricane Drizzle was a bit of a relief. 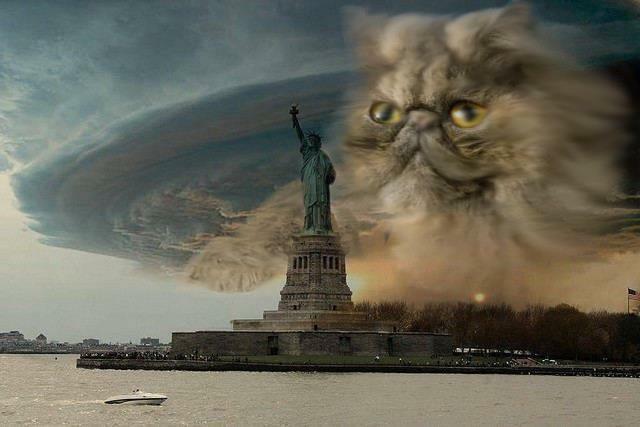 Hurricane Sandy rears its ugly head over New York Harbor. More or less vicious than bad-tempered, 12-year old Siamese cat Sandy? News at 11. In truth, this storm messed up the shore points and NYC pretty bad, which is a real shame. Luckily, the monster-themed storm did not turn out to be as destructive as originally projected. Back on the Occupy site, we enjoyed just a bit of basement water and acute power outages of only a few seconds each. We are very thankful that the only real inconvenience was that I moved every tool and piece of lumber into basement Saturday for the bank appraisal, only to find out after the appraiser left, that there was a hurricane coming. So I spent the whole day moving everything up to higher ground considering we have the potential to get a little water in the basement on hurricane occasions. After all, South Philly is built on a swamp. What were they thinking?? Saturday night was our first official night in the new master bedroom. With the Hurricane coming the next morning, I was thinking about why I had renovated this room in the first place: Hurricane Irene. Irene totally decimated Vermont, and along that path to destruction it put a hole in our roof. Once I was getting water in the master bedroom, I sort of "bumped up" the priority of renovating the upstairs. With a full re-wire of half of the upstairs, new electric panel, re-framing a ceiling, and new walls, new built-ins, and new (excessive) trim... this became a big project. Especially when confined to nights and weekends. I know what you're thinking: with that wallpaper, I should be sending Irene a thank you letter. Regardless, I am thankful that in the wake of Hurricane Sandy, the just-finished bedroom remained intact. I told my wife that if the new bedroom gets damaged after our first night in it, I will willfully walk myself into the mental institution. She told me, "you won't have to walk, I'll give you a ride." We are a good pair. Your WIFE!!! I Can'tr believe my baby sister is some dude's wife....CRAAAAAAAZY.